This historic wharf and slipway is situated at the northern end of Tintern. The Royal Commission on the Ancient and Historical Monuments of Wales refers to the ‘Tintern Ford, site of alleged Battle’, and it is also mentioned in ‘The Island Chapel of St Twrog’ by J G Wood: ‘Another Roman road crossed the Wye at Tintern Ford. This was guarded by a large camp on Madgett’s farm’. The Customs Accounts Particulars for Bristol in the National Archives talk of the ship called The Marie Tintern, master Stephen Gogh, possibly owned by the Abbot of Tintern Abbey (He was a member of the Bristol Staple – i.e. merchants exporting wool etc. through Bristol), which sailed from Bristol to Bridgewater on 1 July 1461 with a large cargo of Welsh cloth and rough undyed cloth belonging to over twenty different merchants (including Chepstow merchants). At that time Sir William Herbert of Raglan Castle had assembled an army at Bridgewater to attack Lancastrian strongholds including Dunster Castle in Somerset, and a number of other places in Hereford and Wales. It seems possible that the cloth was used for equipping his troops. Although this reference does not relate to Tintern itself, there is evidence to indicate that goods such as wool must have been sent from Trellech via Tintern by ships on the Wye, and other goods from elsewhere, including wine, must have been brought to the quay at Tintern. 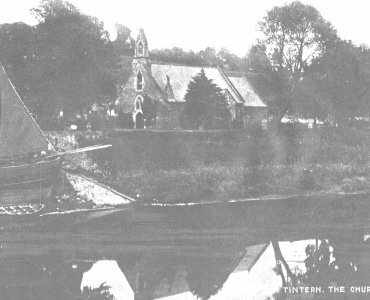 Tintern was a stopping place for ships trading between Monmouth and Chepstow, goods possibly being transferred to smaller boats for the journey upriver. The owners of the Tintern Parva Estate had large ships by the names of ‘the James and Francis during the 16th and 17th centuries that presumably used the wharf. Documentation from the 19th century refers to the structure as a public quay and in 1844 the tithe map shows the ‘Old wharf ‘owned by the Duke of Beaufort. The 1881 and 1886 maps show ‘the wharf’ marked and the 1901 map marks ‘the slip’. The wharf and slipway were still in use in the early 20th century, particularly in the timber trade as witnessed by some of the old photos, but the slipway fell into disuse in the mid-20th century and was covered over and built on. The time is now right to reveal and restore this important historical feature for all to see. In recent years a group of local history enthusiasts has formed a sub-committee of the Wye Valley Building Preservation Trust in order to investigate the archaeological remains on the site, and they are engaged in fund-raising in order to restore the slipway for future use of the public.